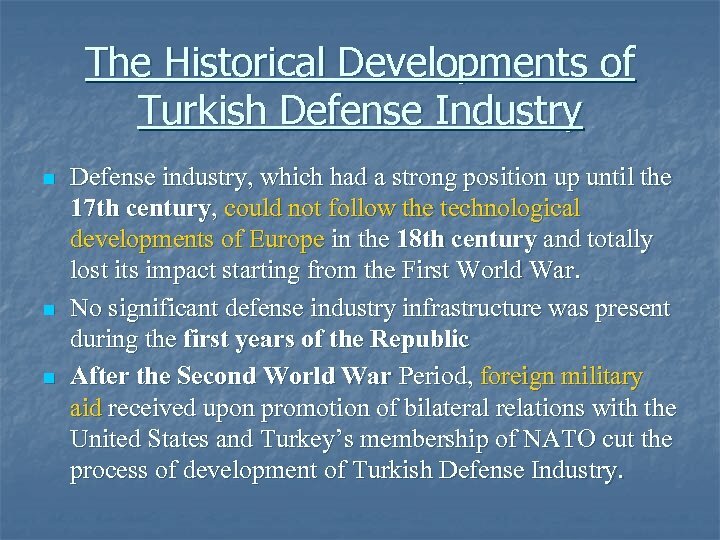 The Historical Developments of Turkish Defense Industry n n n Defense industry, which had a strong position up until the 17 th century, could not follow the technological developments of Europe in the 18 th century and totally lost its impact starting from the First World War. 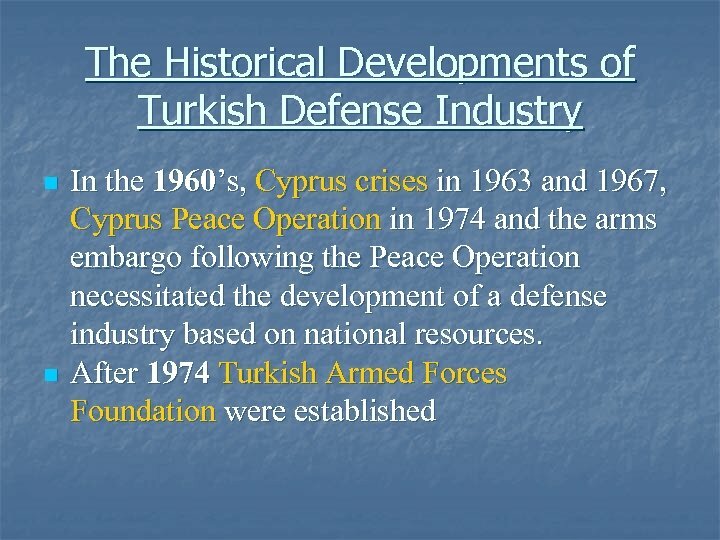 No significant defense industry infrastructure was present during the first years of the Republic After the Second World War Period, foreign military aid received upon promotion of bilateral relations with the United States and Turkey’s membership of NATO cut the process of development of Turkish Defense Industry. 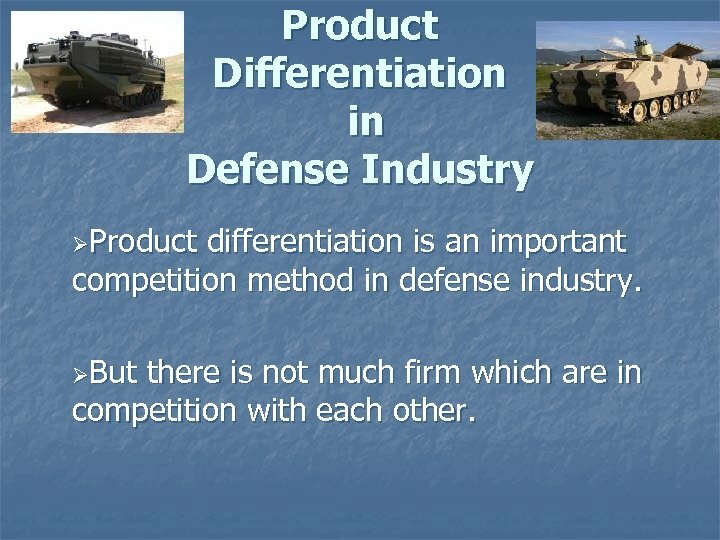 Product Differentiation in Defense Industry ØProduct differentiation is an important competition method in defense industry. 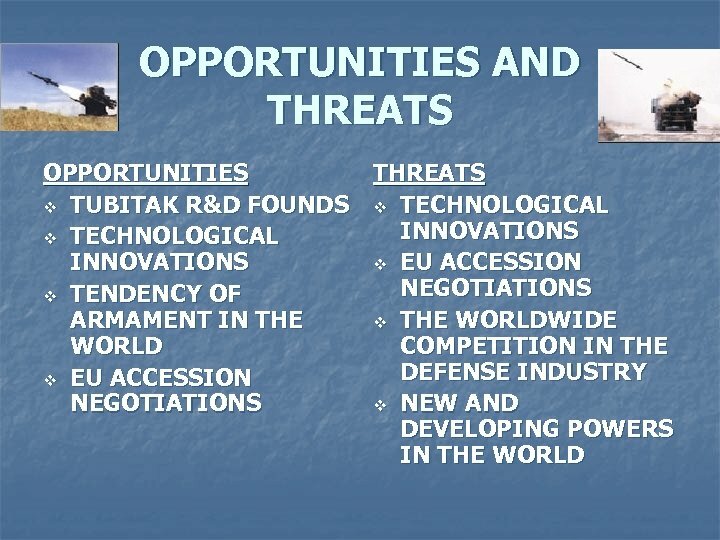 ØBut there is not much firm which are in competition with each other. 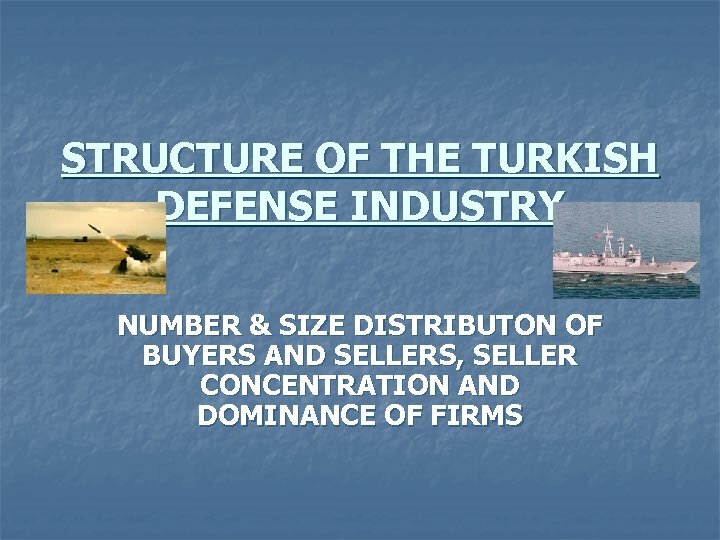 Diversification in defense industry Ø Ø Turkey continues in its role as the “Crossroads of the World, ” a land bridge between Europe and Asia, and Turkish firms remain active in Russia, the Caucasus, Central Asia and the Middle East. 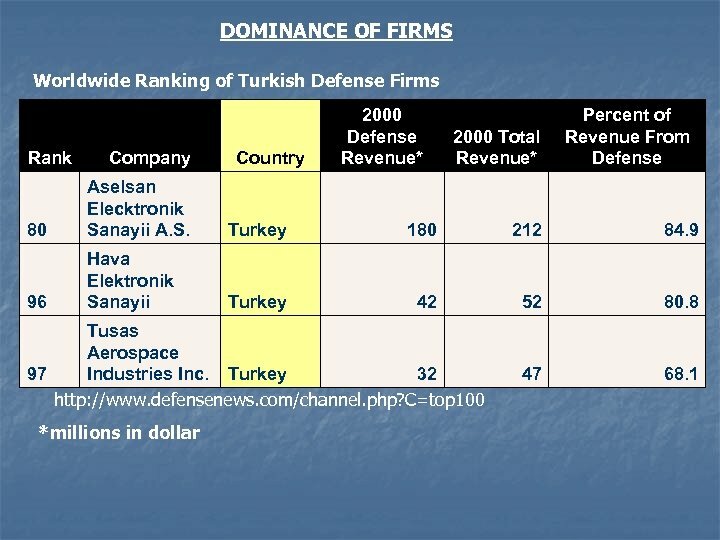 So the Turkish market offers strong growth prospects across the board for all the firms from different countries. 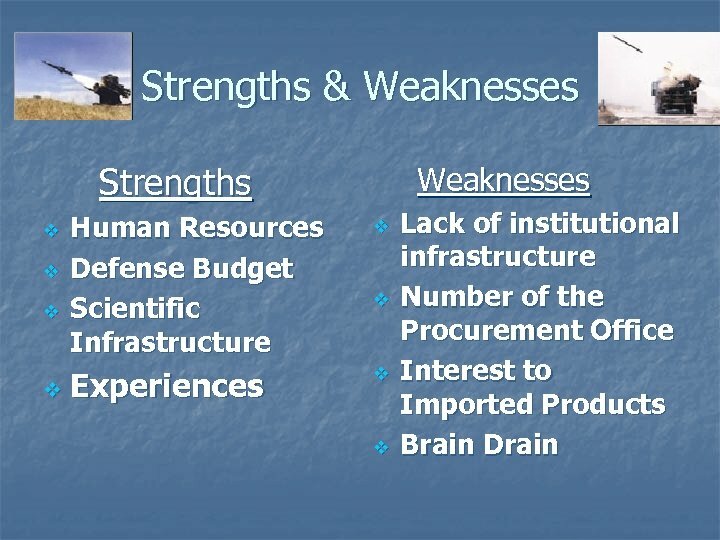 To meet new opportunities, all companies should diversify their product bases to include equipment with defense. 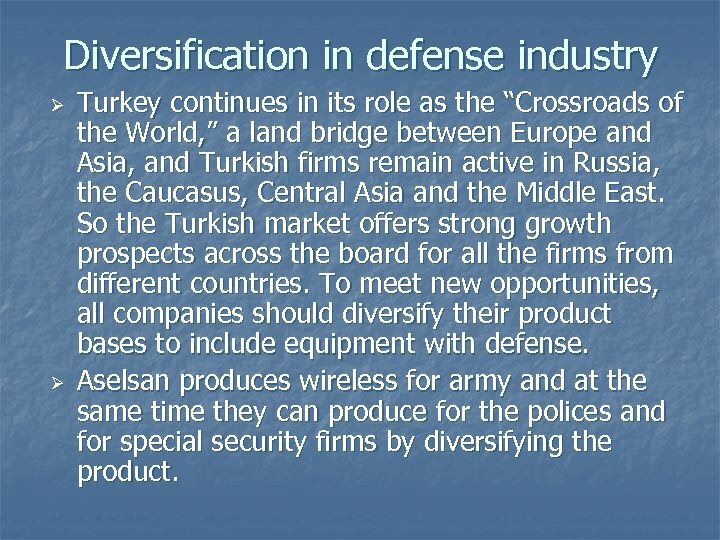 Aselsan produces wireless for army and at the same time they can produce for the polices and for special security firms by diversifying the product. 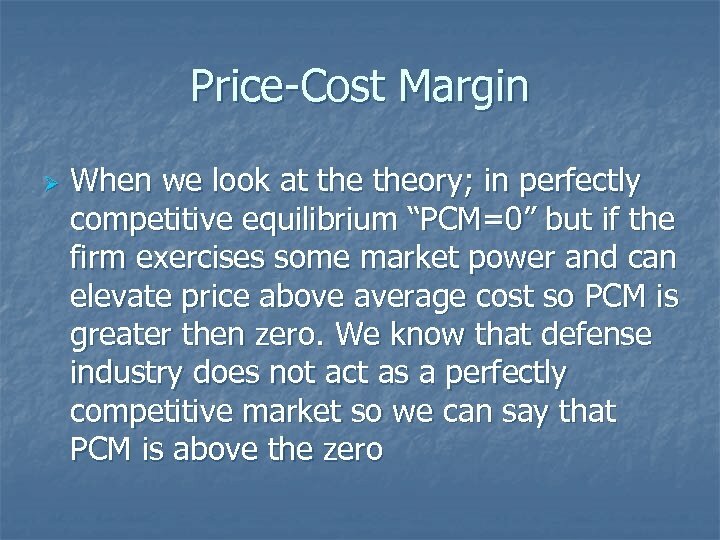 PRICE SETTING MECHANISM PRICING POLICY !! 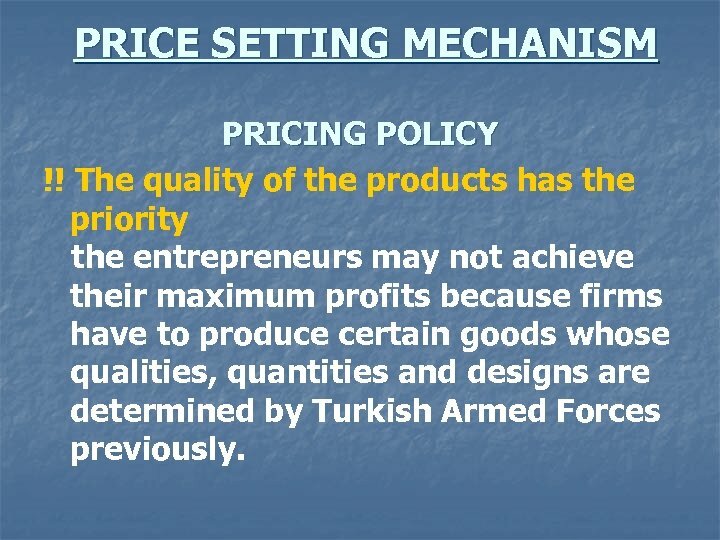 The quality of the products has the priority the entrepreneurs may not achieve their maximum profits because firms have to produce certain goods whose qualities, quantities and designs are determined by Turkish Armed Forces previously. 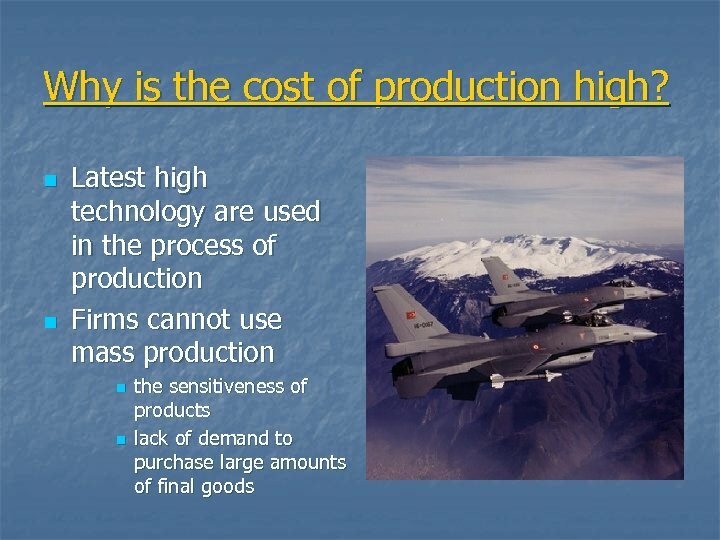 PRICE ELASTICITY OF DEMAND n n There is only one buyer (TAF) and large numbers of sellers, which is called monopsony market TAF always prefers to buy the defense products in internal market, if current technology in the country is available and also the costs of production are not so high. 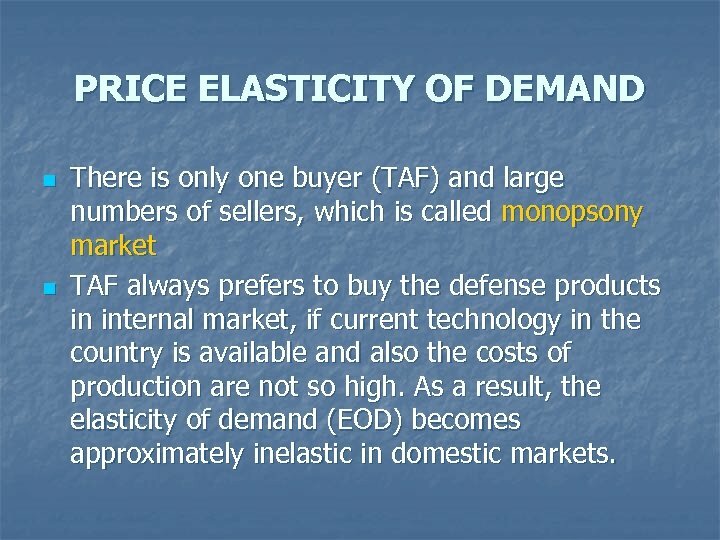 As a result, the elasticity of demand (EOD) becomes approximately inelastic in domestic markets. 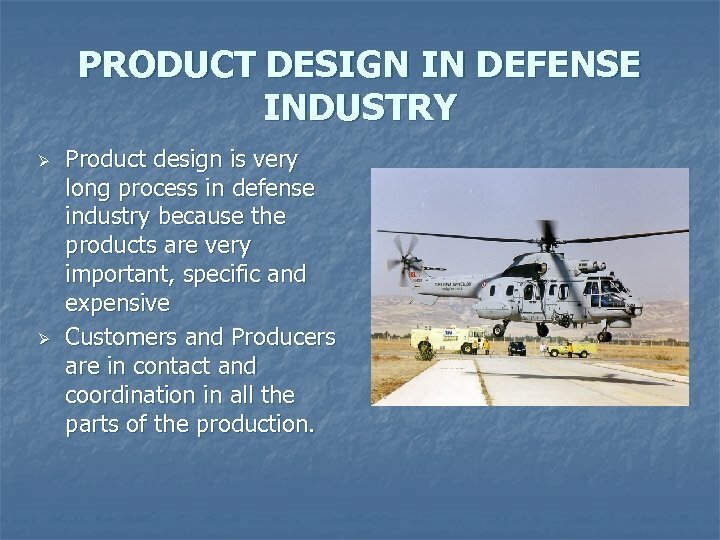 PRODUCT DESIGN IN DEFENSE INDUSTRY Ø Ø Product design is very long process in defense industry because the products are very important, specific and expensive Customers and Producers are in contact and coordination in all the parts of the production. 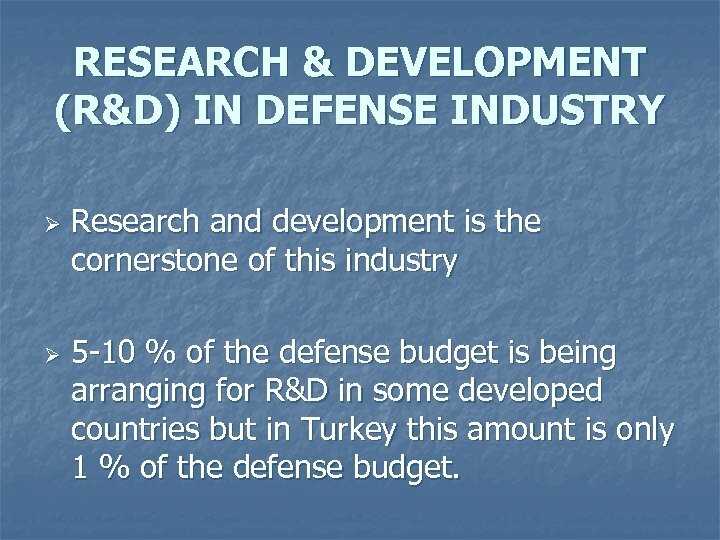 RESEARCH & DEVELOPMENT (R&D) IN DEFENSE INDUSTRY Ø Ø Research and development is the cornerstone of this industry 5 -10 % of the defense budget is being arranging for R&D in some developed countries but in Turkey this amount is only 1 % of the defense budget. 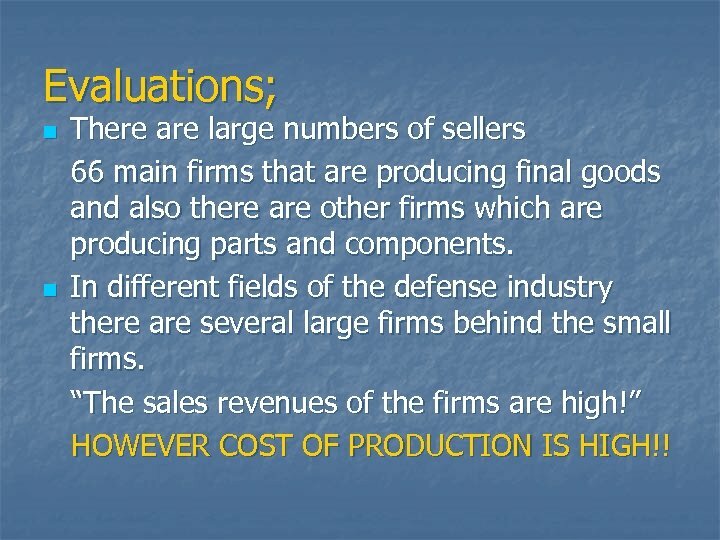 Merger Advantage; Companies’ competition power will increase. 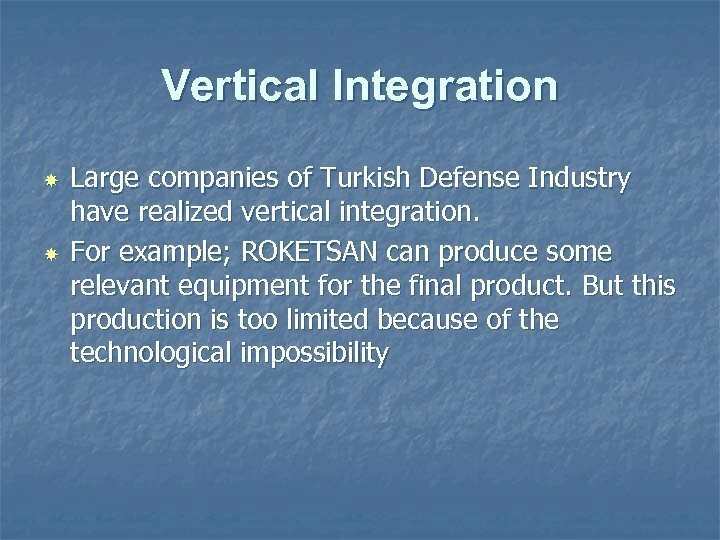 è î Huge mergered companies couldn’t reach in Turkish Defense Industry. 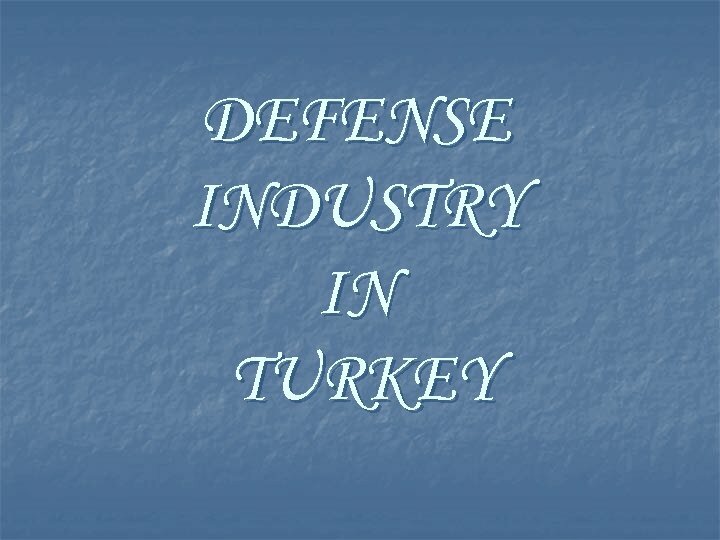 § We mention that Aselsan is a big company but its annual revenue is only 200 -250 million dollars. 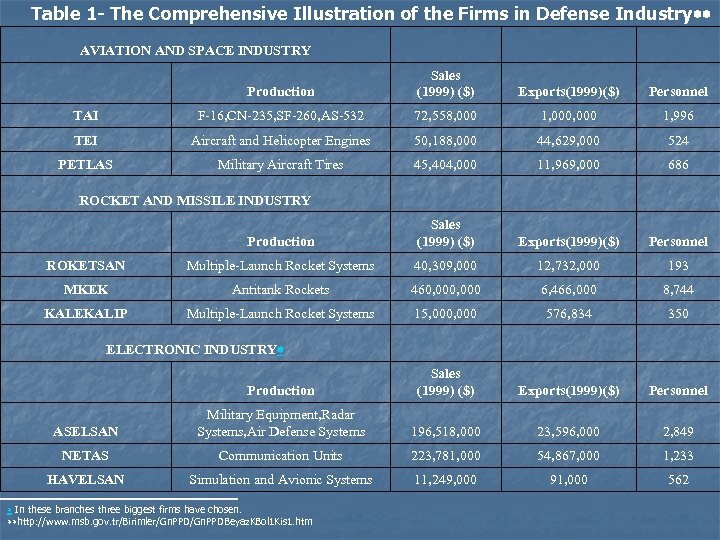 On the other hand, Lockheed Martin’s annual revenue is approximately 22 billon dollars. 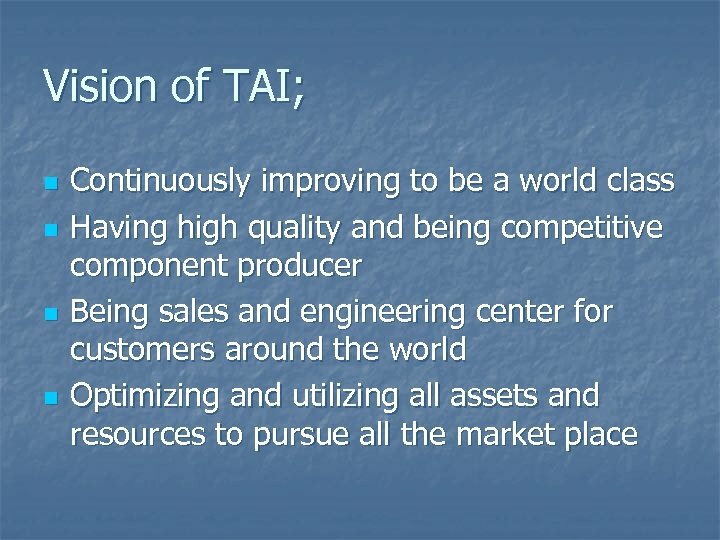 In april, 2005 TAI and TUSAS agreed to merge under a single corporate identity. 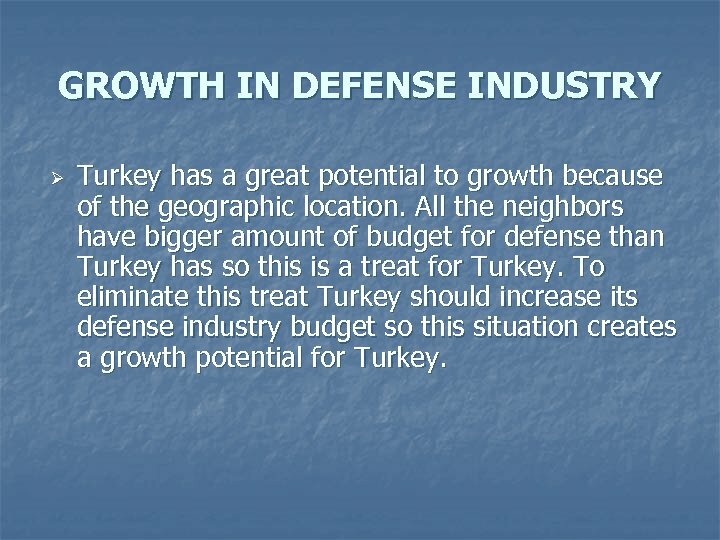 GROWTH IN DEFENSE INDUSTRY Ø Turkey has a great potential to growth because of the geographic location. 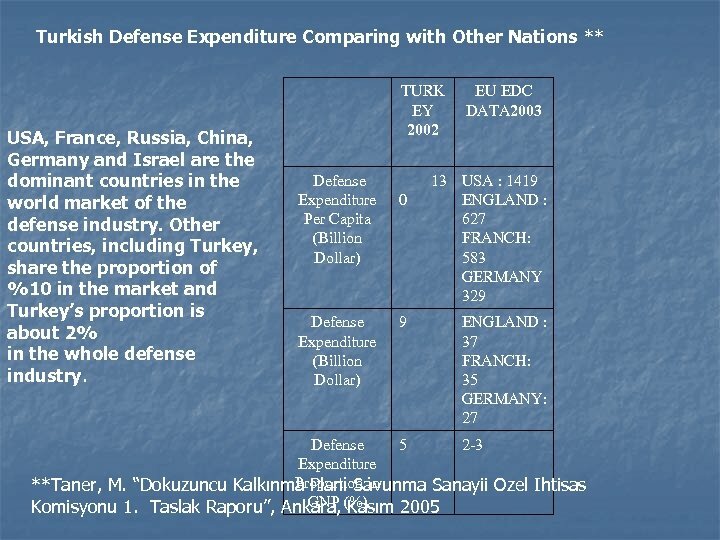 All the neighbors have bigger amount of budget for defense than Turkey has so this is a treat for Turkey. 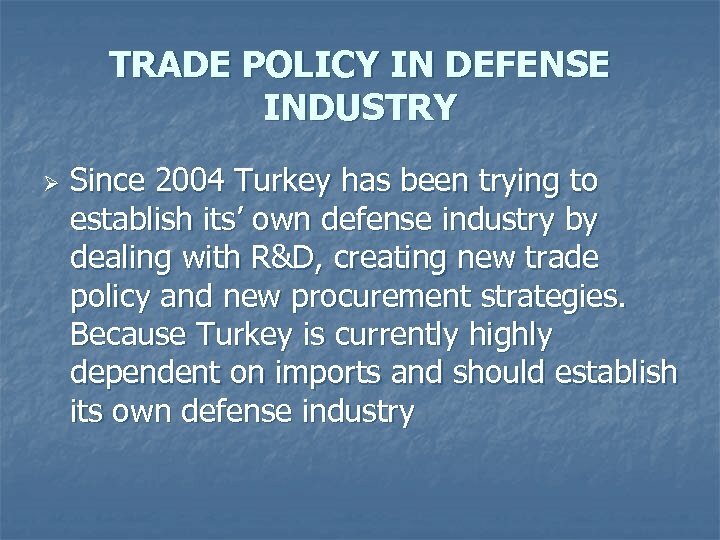 To eliminate this treat Turkey should increase its defense industry budget so this situation creates a growth potential for Turkey. 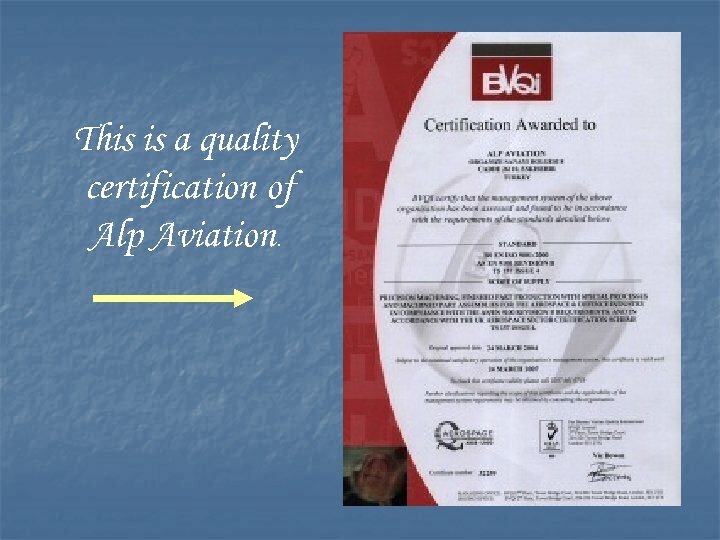 This is a quality certification of Alp Aviation. 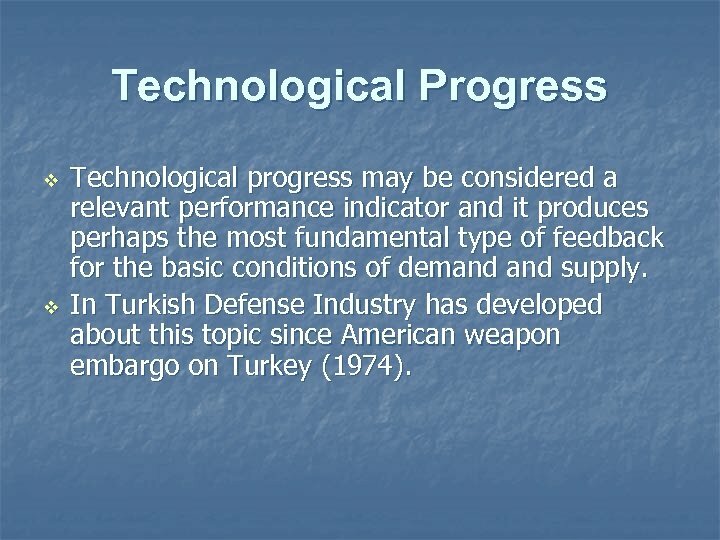 Technological Progress v v Technological progress may be considered a relevant performance indicator and it produces perhaps the most fundamental type of feedback for the basic conditions of demand supply. 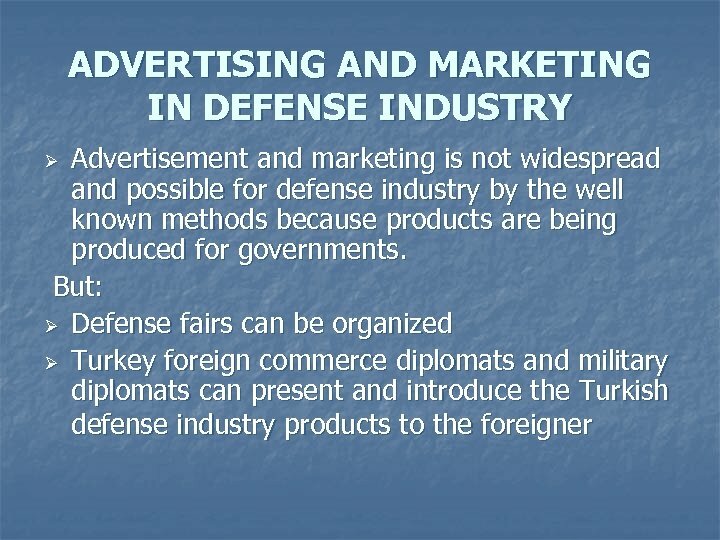 In Turkish Defense Industry has developed about this topic since American weapon embargo on Turkey (1974). 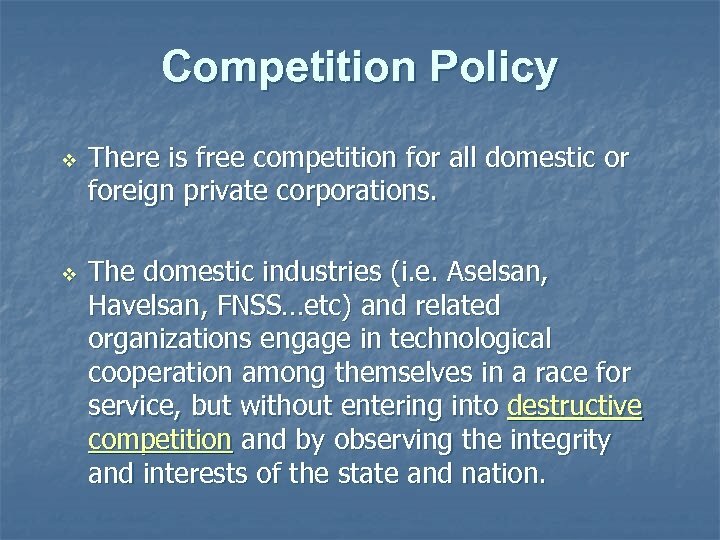 Competition Policy v v There is free competition for all domestic or foreign private corporations. 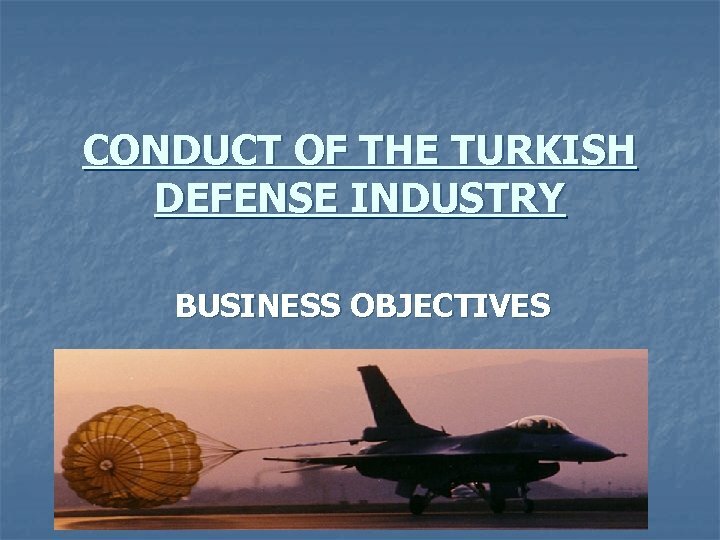 The domestic industries (i. e. Aselsan, Havelsan, FNSS…etc) and related organizations engage in technological cooperation among themselves in a race for service, but without entering into destructive competition and by observing the integrity and interests of the state and nation. 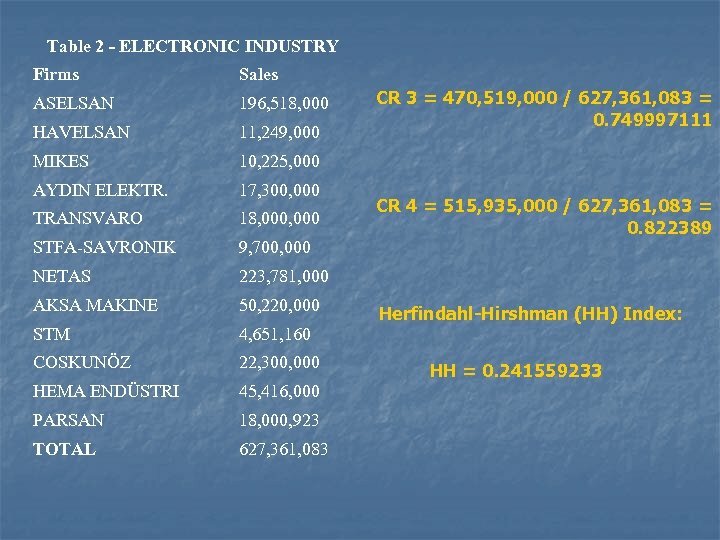 Taxes Some taxes will be mentioned at the below that are paid by the domestic companies; v Decision stamp : %0, 45 of agreement value. 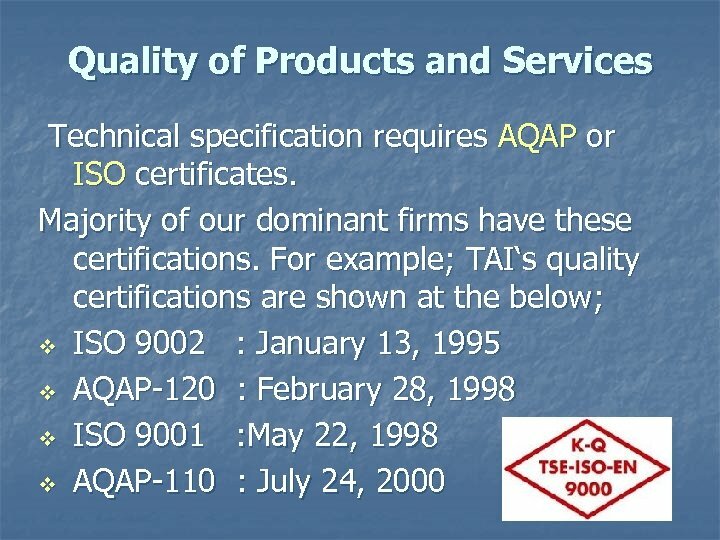 v Agreement revenue stamp: %0, 75 of agreement value. 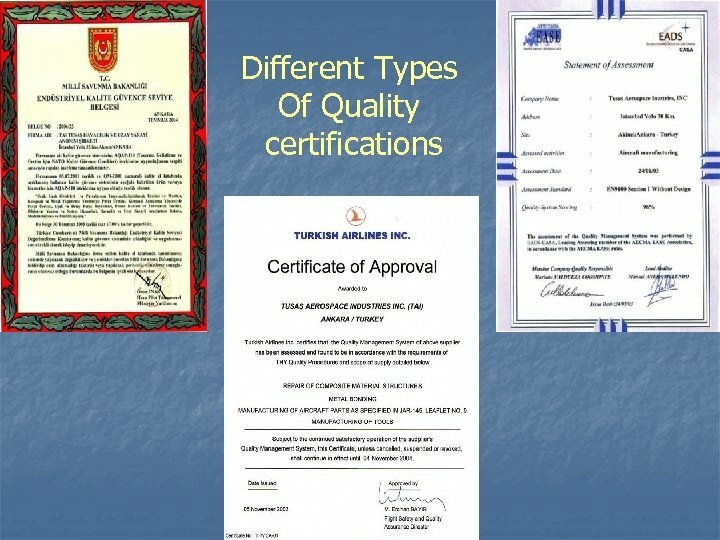 v Advance revenue stamp: %0, 75 advance payment. 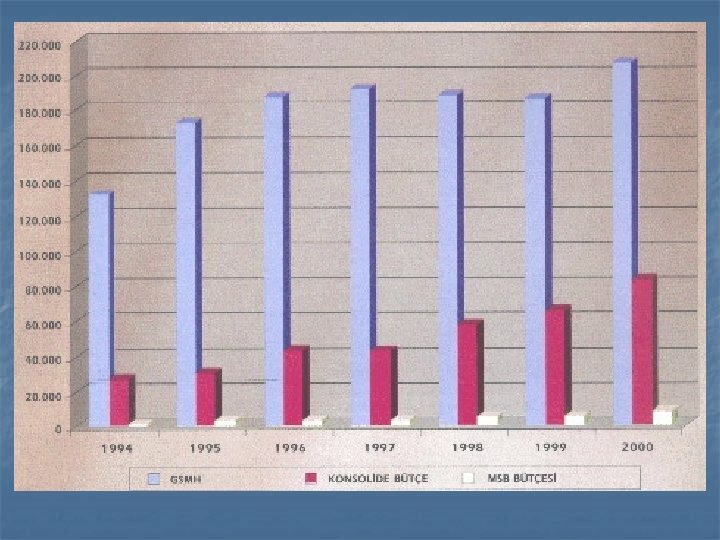 v Value added tax: %18 of bill value. 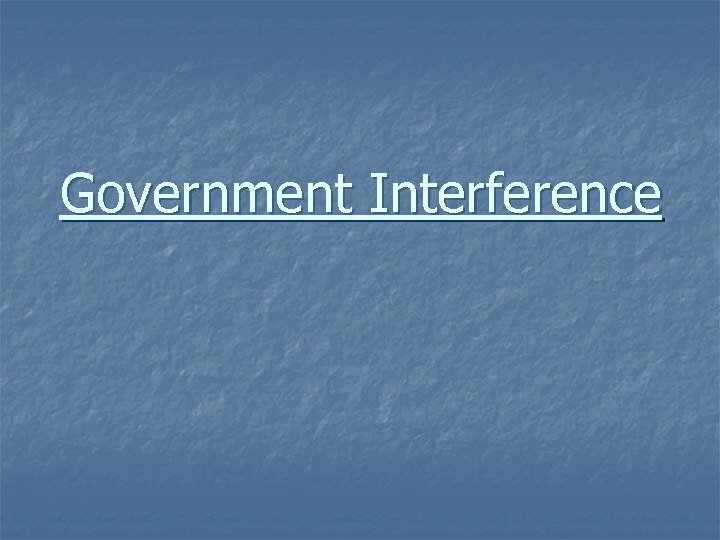 Total direct and indirect taxes are approximately %30 of companies’ net income. 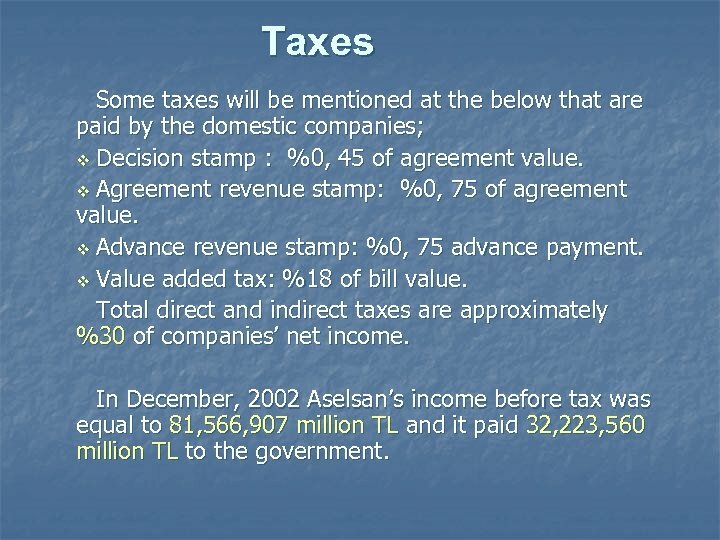 In December, 2002 Aselsan’s income before tax was equal to 81, 566, 907 million TL and it paid 32, 223, 560 million TL to the government. 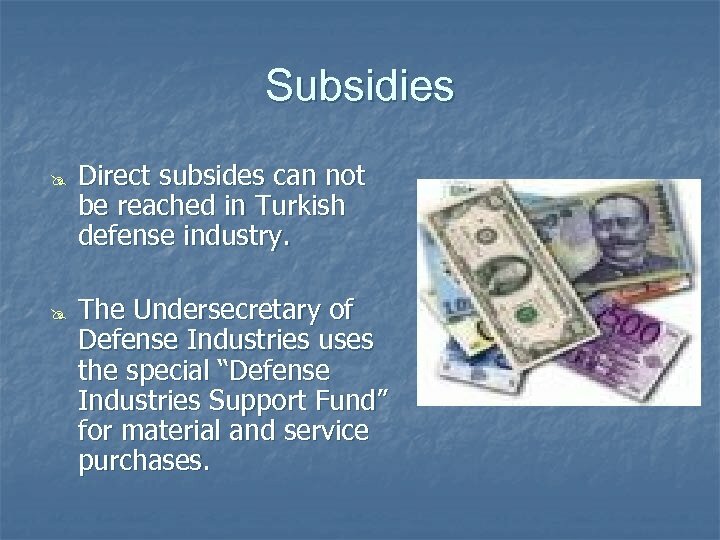 Subsidies @ @ Direct subsides can not be reached in Turkish defense industry. 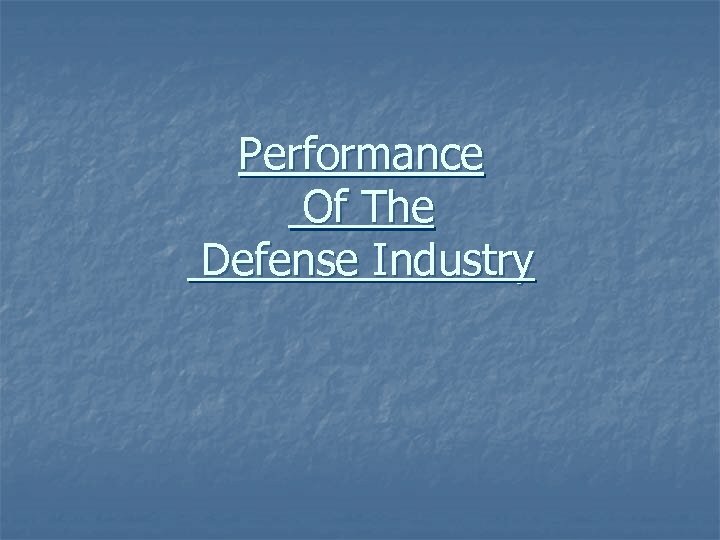 The Undersecretary of Defense Industries uses the special “Defense Industries Support Fund” for material and service purchases. 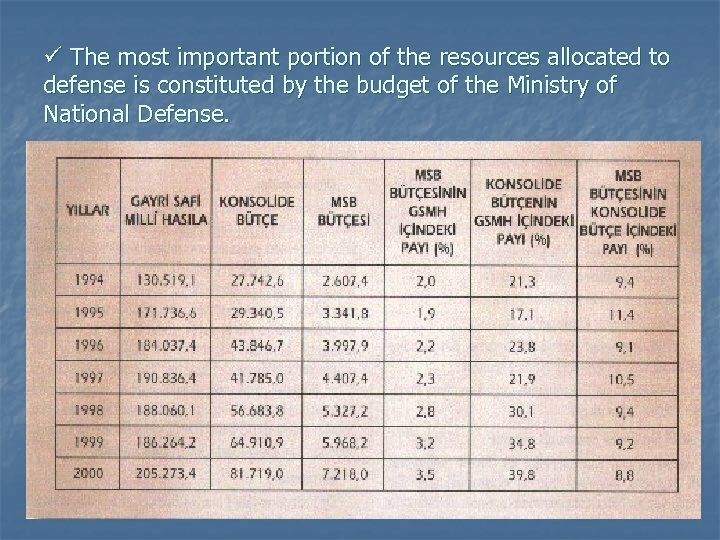 ü The most important portion of the resources allocated to defense is constituted by the budget of the Ministry of National Defense. 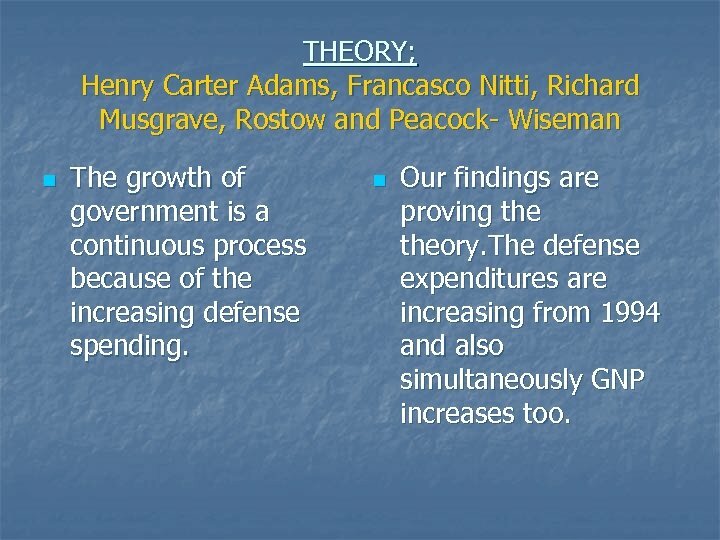 THEORY; Henry Carter Adams, Francasco Nitti, Richard Musgrave, Rostow and Peacock- Wiseman n The growth of government is a continuous process because of the increasing defense spending. 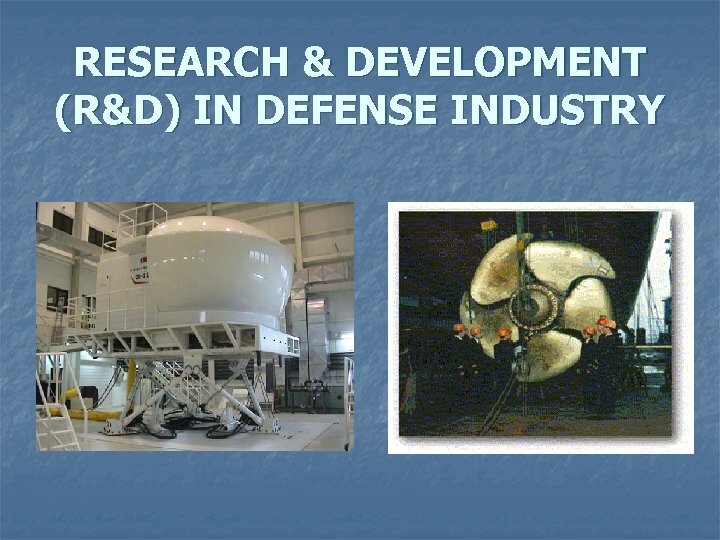 n Our findings are proving theory. 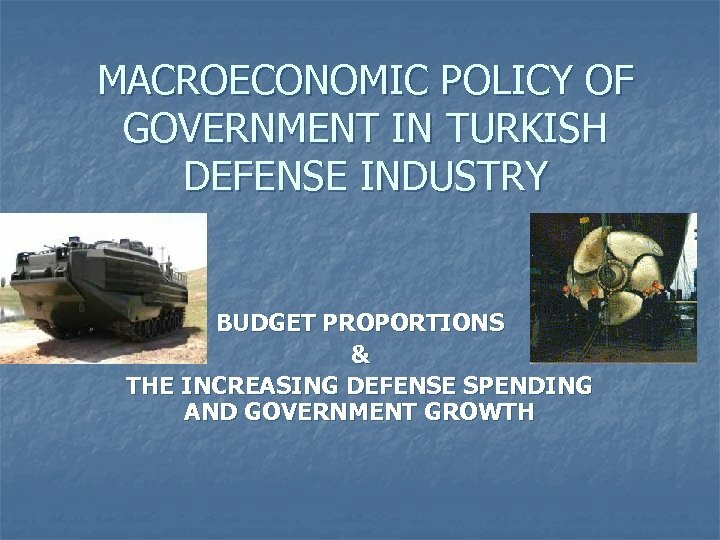 The defense expenditures are increasing from 1994 and also simultaneously GNP increases too. 1. ) 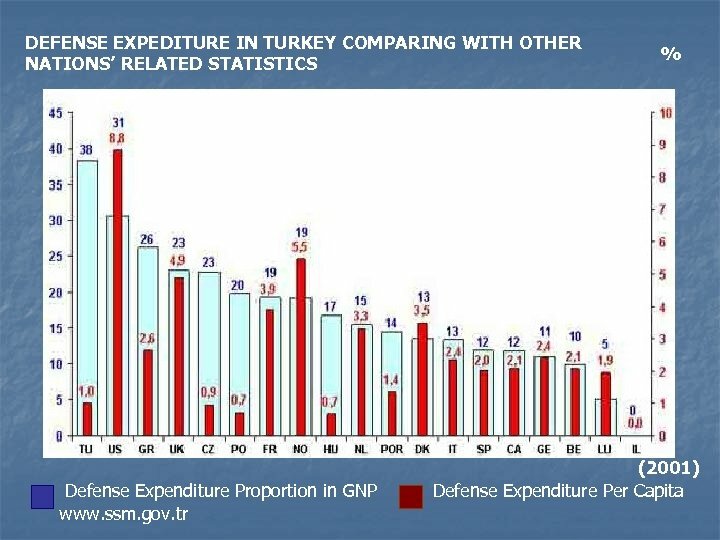 Political side: * If Turkey wants to attain its main target , it should consider that SSM as only authority for all decisions. 2. ) 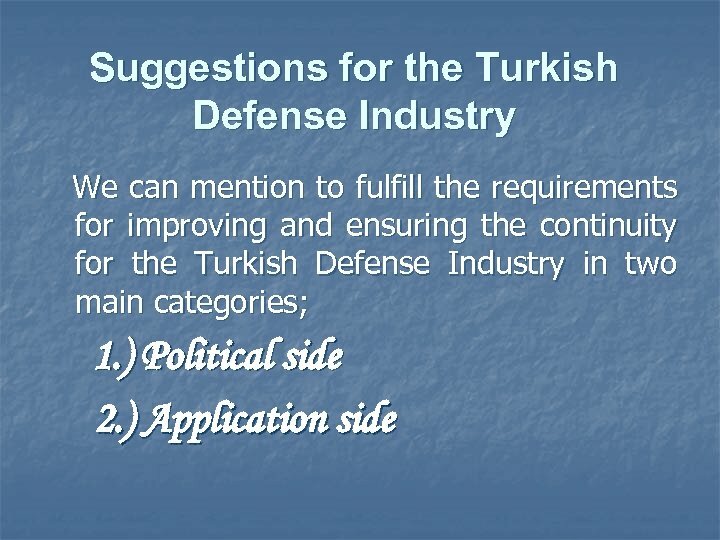 Application side: * To increase the production capacity of firms * Domestic companies should be supported for improving new projects * To organize a subsidiary mechanism for our companies and tax rate ought to be decrease. 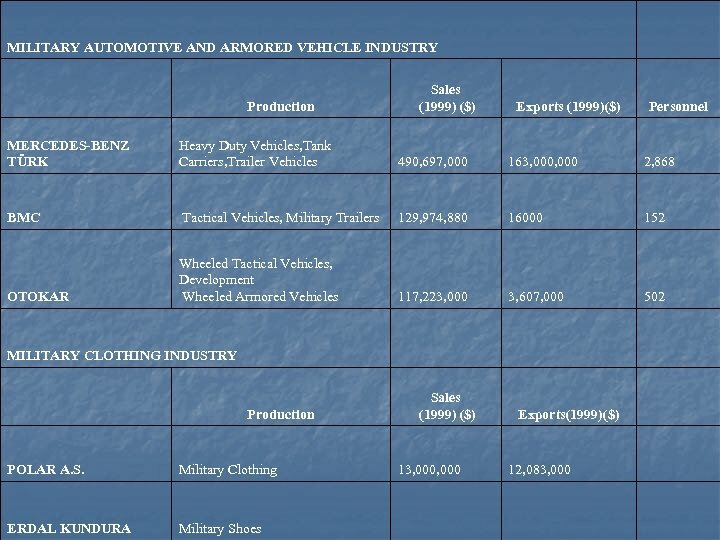 * To organize a loan mechanism for export aims. 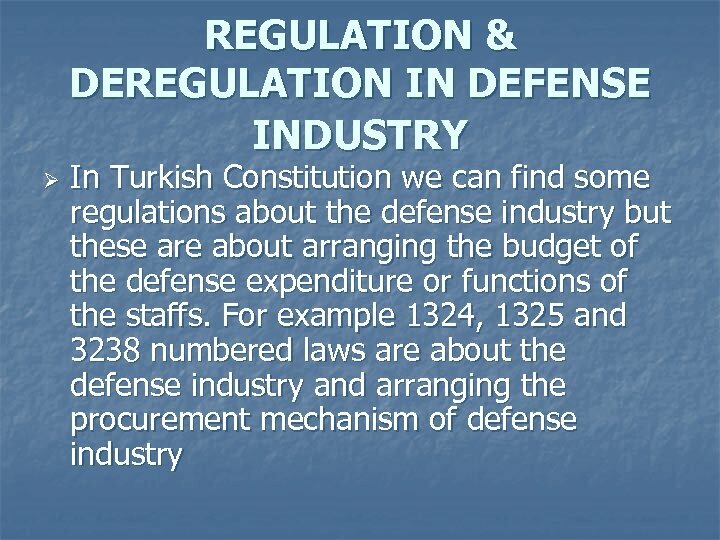 * Defense industry should be propped up by the Offset mechanism. 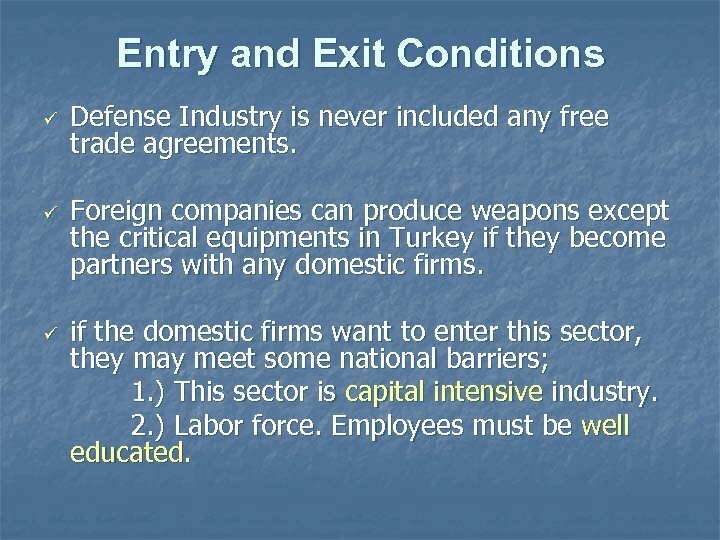 * High qualify labor force have to be supported by the government. Otherwise, they might go abroad for working.